I initially responded by citing my series on Pascal’s Wager, explaining that, while there is no direct empirical evidence for the existence (or non-existence!) of God, there are plenty of other methods for showing a difference in the believability of the various Gods. What you *really* want here is an experimental test. Show us this goddy thing, and let us fire protons at it. So let me take another stab at it – rather than giving him the sensible argument I gave (there is no empirical test, but that does not mean that we don’t have other methods by which to distinguish between metaphysical claims), I’ll try another valid one – that is, empirical science is not yet able to measure the spiritual – it can barely quantify, measure, or understand the psychological realm, so what makes us think we can evaluate the spiritual? Hubris abounds in metaphysical discussions – both sides calling the other idiots for what is patently obvious (God exists, god does not exist), and neither admitting the limits of their own reason, empirical methods, and experience. Atheists have a very good objection, however, to Christian faith and experience – how come you can’t measure it to show that it is more than imaginary? Appealing to authority (“the Bible says so”) or to experience (“God is real because He changed my life”) are not really valid logical arguments. That does not mean that such claims are untrue, only that this is not really proof. But I would like to suggest that empirical proof for God may be around the corner, and atheists need to suspend judgment. I’ll add that experiments that have seemed to show that prayer does not change things may be premature, and in and of themselves are not entirely damning or conclusive. In the beginnings of science, very little of the actual mechanisms behind reality was known. And before instruments were invented to view objects far away, very small, or otherwise invisible to our senses, the existence of such things as galaxies, DNA, or cosmic rays was unknown, and even if postulated, was not confirmable with empirical science. But then the microscope was invented, and a host of other methods and instruments in physical science, driven by Newtonian physics and advances in chemistry and biology. Suddenly a whole new realm of reality was available for empirical evaluation. Before Albert Einstein, the physical sciences were ruled by the Newtonian view of physics, and Kepler’s laws of planetary motion. Unfortunately, they did not explain some of the empirical observations we were making. As it turns out, gravitational effects, and the behavior of light were just not well enough understood, not to mention the implications when including the fourth dimension of time. However, Einsteinian theory led to many more discoveries and empirical methods that we could use to explore our reality. And a whole new realm of reality was now understandable and quantifiable. 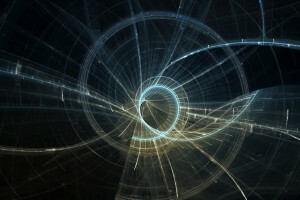 Quantum physics, however, is opening up yet another realm of reality. One of the most interesting expermiments is the Double Slit Experiment, which has shown that the mere act of OBSERVING electrons changes their behavior. I would like to suggest that the quantum arena may open up a way to measure the function of mind, independent of the physical chemical body. And THIS may be a way to measure the spiritual claims of the religious, and atheists need to postpone judgement and admit the limits of current science, not to mention reason itself. The Bible describes man as being tripartite, having three parts, namely body, soul, and spirit. While science has done a good job of explaining the physical body of man, it has also ventured a short distance into the soul of man via psychology. This ‘soft’ science has yielded some tremendous insight into the developmental processes of human development, and has even offered some decent results in curing the emotional ills of mankind (it may even have explained the psychology of atheism and unbelief). But in many ways, we are far from a complete understanding of the human soul, and there is much that is still not understood. Why is it then, if we have a moderate knowledge of the body, and a slight to moderate scientific understanding of the psyche (soul), that we suppose that science’s lack of ability to empirically confirm the spiritual, an arguably even more complex and hard to understand part of mankind is any kind of reflection on the reality of spiritual things? It may be generations before a “God particle” is discovered, or that we can measure the spiritual. I have many times said that by restricting themselves to the materialist view, anti-theists have taken the ‘safe’ route. That is, trusting no one or nothing unless it can be empirically validated, they are essentially living by their own wits. Content to live within the limits of their reason and the current state of science, they often fail to take advantage of trustworthy sources of wisdom because they don’t believe it unless they first see it. While some may want to live this ‘careful’ lifestyle, I prefer one of calculated risk – one of ‘faith searching for understanding’ rather than the converse. Is there currently an empirical method to PROVE that God exists? No, but neither is there on that can DISPROVE God. Of course, the burden of proof lies with the one making the positive claim (the theist), but I would hasten to add that we DO have methods for distinguishing between faith claims – some are obviously bogus. But to assume that they are all bogus is for those who can not trust, either others or themselves, to explore the subjective metaphysical world, and who fail to use the other epistemelogic tools at hand. It is, sadly, for those who prefer to not have faith, rather than to have had faith and lost. On the other hand, maybe the next Hitler, Stalin, or John Wayne Gacy has already been aborted. "What if's" are a poor argument for any position. True, but that is really the point: what if – means we don't know. People think they know everything about everything. Most people (especially atheistic or scientific people, philosophically speaking) can't stand it that they don't know everything, and they jump to conclusions based on the few things they DO know. But, because there are some things that they will just never have ALL the evidence for, they CANNOT KNOW everything about everything. Yet they disparage faith… Even though they must have it in order to think about ANYTHING, have ideas about ANYTHING they do not know about. I think your statement holds true for religious people as well. The fallacy runs across the board. Why, then, pick on atheists or "scientific people"? In my experience, religious zealots really can't stand not knowing everything, and often resort to violence and persecution when their beliefs are questioned. Intellectual humility is a virtue no matter what your worldview.